We order these with all the bells and whistles. Every option included on our model. 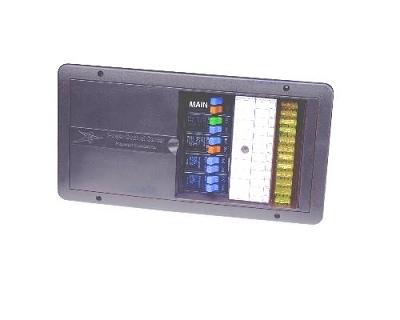 Provisions for 30 Amp AC main and up to 9 AC branch circuits. Generous wiring space for easy installation– also reduces costly wiring errors. Built-in wire strain relief for each branch circuit. Saves over 50% on installation costs. Space for up to 12 fused DC branch circuits for 12 Volt lighting and DC appliance circuits. Accepts rated fuses up to 30 Amp – eliminates auxiliary fuse panels for slide-outs and leveling jacks saving you even more money. Attractive light weight panel design made from black or brown impact-resistant high temperature polymers. 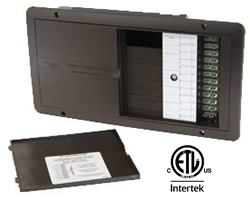 All 12 VDC branch circuit connections located on outside rear of panel – reducing installation time and costly errors. High current 12 VDC input power terminal strip provides easy connection point for battery and converter.